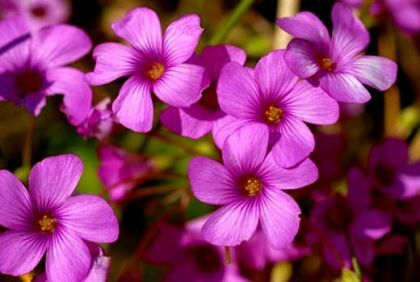 Pink-sorrel is not easily confused with other wild plants on this web site. This is a tufted, hairy perennial with 5-petalled pink flowers (15-25mm) which grow in umbels on long stalks. 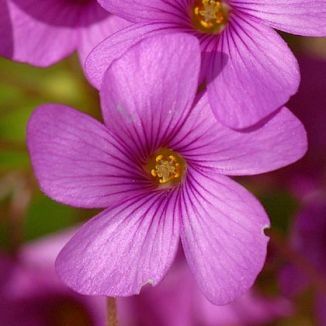 The leaves are like those of Wood Sorrel, trifoliate, each heart-shaped leaflet marked with little orange or brown spots. It flowers from May to September, is an introduction and belongs to the family Oxalidaceae. I first knew this plant as a garden plant but found it growing as a 'garden escape' in Ringsend, Co Dublin and also at Tacumshin, Co Wexford, both in 2008. It was photographed at Ringsend. Originally from South America, this plant has now become naturalised and can frequently be found on disturbed ground and waste sites.